The only one I see missing is Ewok Village. Not sure why you don't include that or red 5 in your list... That was released in September 2013. Those are the only two that haven't had a retired tag applied to it in the States from 2013... Good list. I attempted to do something similar last year, but it became overwhelming around the holiday season since the oos to available changes were almost hourly. Good one Fossilrock... first I decided against including those as I had a less ambitious scheme in my mind (only US, only up to 75097...) but you're right that it now looks a bit incomplete. I'll add the sets and also give a slight update on a few points (this list was drawn up two days ago and a couple of things have already changed). Will be ready in half an hour or so. 75059 Sand Crawler: changed from 'out of stock' in US to 'available' in Europe. 75102 Poe's X-Wing changed from 'exp. 29 Jan. to 'available' in Europe. I noticed the MTT just recently went out of stock at TRU as well over the last week. And since it was a TRU exclusive, that makes it done and in the hands of the secondary market at this point. There maybe a few stragglers at TRU stores, but it's pretty much done. The other exclusive, the Sith Infiltrator is also showing weird signs, just like some of the other 2015 summer wave sets. Not sure how to take all the signs, anymore because I would have expected T-16 and the AT-DP to still be in stock at this point, but they showed similar signs like this about 5 months ago, and now they are retired. Today I decided to update the lists, rather than just mention the updates below the lists. I think an up-to-date overview is more useful than a reference list from which you an deduct the current status. A list of updates will still be available below the lists. I also corrected the term 'republican gunship' to 'republic gunship'. Thanks for the alert Reddit user who tipped me on that. @fossilrock indeed I had to double-check the out-of-stock/available-status of the Sith Infiltrator. That's one of the few sets where EU/US availability is contrary to the trend. 10240 X-Wing Red 5: changed from 'temporary out of stock' to 'retired' in Europe. Interesting to see that 75101 and 75105 (new wave star Wars sets) became available again, whereas all action figures which were out of stock are still out of stock. The list was updated again. Ewok Village and Slave I are available in US once more. 75087 and 75096's expected availability is strangely postponed by one month to 17 March. Keep a close watch on those two! With the MF I think the current demand is simply greater than the production capacity LEGO has allocated for this set. Of course that's what I thought as well... before the change from 'OOS' to 'Available' to 'OOS' within 2 days. That's irregular. Ecto 1 did the same. I guess they are having to cope with a lot of backorders - I think this set is one to forget about till just before next Xmas in terms of investment. Next update. No world-shocking news here. Still I know several people have subscribed to this blog + thread so I think it's a nice gesture to write an update post even though not much changed. The UCS Sand Crawler seems to be having a hard time as regards availability. A couple of days ago it went from 'out of stock' to 'available' in Europe, today it went out of stock again. Expected availability: 1st of March. Is this 'relic' from 2014 slowly crawling towards its sandy retirement? Roy, I just wanted to thank you for providing such a helpful and concise list. This is fantastic! Thanks for that Steve. It has turned out to be a rather soothing experience for me getting all those data (takes appr. 20 minutes now, after practice). It's the kind of schedule I wanted to have acces to for some time, seeing a 'below 75099-number' in a toy store and needing to check Lego (availability) + Brickpicker (price guide). Not very handy to do that with a mobile phone and I always get the feeling that people are watching and I'm not too fond of that (don't want to get a 'reseller reputation' at my local toy stores). So now that I visit toy stores I have this list under my bookmarks. I simply refresh it to get the most up-to-date info and casually check it whenever I see something nice. So I'm only happy to be able to share this with you guys. Online list is the best for me personally (it can be refreshed in my phone) so it's only logical if I put it in a blog like this so anyone interested can use it. @Changes: I had hoped that the action figures 75107-75112 would slowly die toward retirement in Europe: they are 1st series, there's already a second series, they regard the pre-awakens movies and they have been marked 'temporarily unavailable' in Europe for some time now. Unfortunately today 75108 made a comeback. Slightly comical are the status changed of 75102 Poe's X-Wing in the US: on January 31 it changed from 'exp. 6 February' to 'exp. in 30 days'. One day later it turned back to '6 February'. And today it turned back again to '30 days'. Let's see... my prediction for tomorrow on this set is 'exp. 6 February'. Today's update of this list looks promising, at least to me. Yesterday I almost lost my hopes for the 1st series of action figures approaching retirement, because Cody came back. Pls. read previous post. However, today Cody went out of stock again, back to the mysterious 'temporary unavailable' status. Plus, the same happened to the Luke Skywalker action figure. The only available-remaining set in that series is Obi Wan Kenobi, a prequel-inspired design. If I had to bet I'd say TLG has ceased producing these 1st wave action figures. If anyone has a recent seal code of any of these, please share in this thread. Prediction not completely correct, but it did change again (exp. 18 February). Interestingly I first thought it was also like that with sets 750587 and 75096 which were both listed as 'out of stock' on the overview page but when clicking on those items they said 'available'. Clicking back and refreshing the browser, on the overview page it still said 'out of stock'. A few minutes later the overview page shows 'available' too. Guess I happened to be making this update while TLG did theirs. Anyway we now know that the item individual page is updated (a little bit) sooner than the overview page. Lesson learnt: always double check. Most noticeable news today is that most large sets (Ewok Village EU, Sand Crawler US, Slave I EU, Tie Fighter EU, Sith Infiltrator US) have become available again. 76096 Sith Infiltrator: changed from 'exp. 14 Feb.' to 'available' in US. 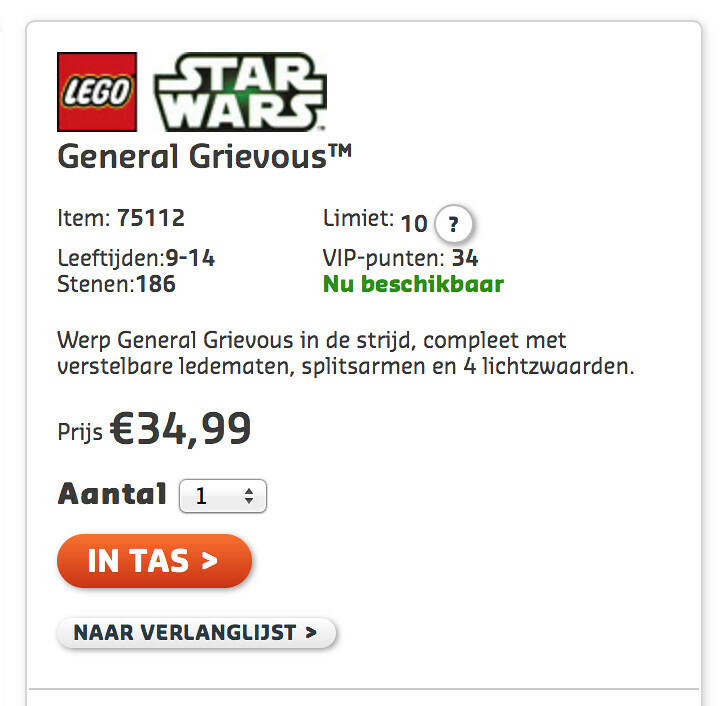 75112 General Grievouw: changed from 'temporarily unavailable' OR exp. 17 Feb.' to 'exp. 17 Feb.' in EU. Yesterday there was little news, so I didn't post an update message. The list was updated though. - 31 January: 'exp. in 30 days'. - 2 February: 'exp. in 30 days'. Not sure why there are almost daily changes only for the US 75102 set. Anyone has any idea about that? Another Poe's X-Wing dance move. For the rest no interesting updates. 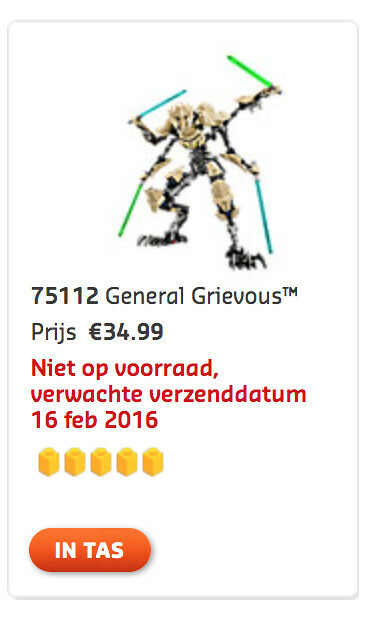 75112 General Grievouw: changed from 'exp. 17 Feb.' to 'exp. 17 Feb.' OR 'exp. 16 Feb.' in EU. Large update: click here for the full list. To improve usability of the list I added information for each retired set -> the number of available days. Green: more than two years availability. Orange: one to two years availability. Red: Less than one year availability. If sets are sold out in EU, this info is given too, but between brackets. Sand Crawler and Slave I have gone out of stock in US (8 days). And of course, Poe twisted his X-Wing again. 75060 UCS Slave I: changed from 'available' to 'exp. 18 Feb.' in US. Some changes in availability today. Both 75X UCS models will be out of stock a little longer in the US. Click here for the full list. I also found proof for my previous theory that a set's details page gives more recent availability info than the overview page: all 1st generation action figures are currently 'out of stock, expected 16 February' according to the European overview page. However clicking on them reveals that they are already available. So as mentioned in a previous post, if at first glance something appears to be out of stock, be sure to click the item; you never know. The info you get on the detail page is often different (expected shipping date: sooner / later / now). It would highly surprise me if all these action figure sets will not have been fully updated as 'available' tomorrow. Sand Crawler and Slave I are back in US stock today! In other news, as predicted yesterday, all action figures have now become available again in Europe. In future updates of this blog I'll simply report the status as seen on the set detail page. Yesterday there were no changes. Today only Sand Crawler coming back available in Europe.